James Xue (right) of Canton, Michigan, answers a question from WRO Judge Fred Brauchler about his team’s concept for a robot system that would collect solar energy while in orbit and then deliver the converted energy to the Earth’s surface. The United States is joining an international student competition for robot design for the first time this year, and on Saturday, Sept. 27, Lawrence Technological University (LTU) will host the first-ever national championships to determine who will represent their country at the World Robot Olympiad (WRO). The competition will be held from 9 a.m. to 4 p.m. at LTU’s Don Ridler Field House, 21000 West 10 Mile Road, Southfield. The public is invited, and admission is free. The Olympiad started in Singapore in 2004. This year nearly 20,000 middle school and high school teams from 49 countries are participating. The winning teams from each country are invited to attend the World Robot Olympiad to compete for gold, silver and bronze medals. This year’s WRO international competition is scheduled to be held in the Olympic city at Sochi in Russia Nov. 21-23. The event will be organized by three government agencies of the Russian Federation, and participants will stay in the Olympic Village hotels and apartments. Military conflict in eastern Ukraine threatens to overshadow this year’s WRO, and the U.S. State Department travel advisory for Russia covers territory just a few hundred miles from Sochi. But so far U.S. competitors aren’t letting politics get in the way of their dreams for an Olympic medal in robotics. This first WRO national competition has attracted teams from California, Oregon, Texas, New York, Illinois and Michigan. Claus Ditlev Christensen of Denmark, general secretary of the World Robot Olympiad, will give opening remarks at LTU and observe the WRO-USA finals. WRO differs from many other robotics competitions because the winners will represent the United States in international competition. “Being selected to represent your country really means something, and the American teams will be competing against the best teams from around the world,” LTU Professor CJ Chung said. 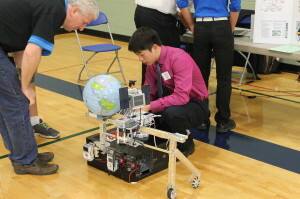 Chung, who teaches computer science at Lawrence Tech, was selected to lead WRO-USA because of his leadership role in LTU’s Robofest competition since 2000. Like WRO, Robofest makes it fun for students to learn important principles of science, technology, engineering, and math, known as the STEM subjects. The regular WRO category competition, which is entitled “Rocket” this year, challenges student teams to build a robot to gather all “rocket” elements, assemble them in the correct order, and lift them with a launch mechanism. In the open category the task is to design and create robots that will assist humankind in solving tasks in space. “Robotics is fun for these students because what they create actually comes alive. That’s what autonomous robotics is all about,” Chung said. For more information, go to www.wroboto.us. Lawrence Technological University, www.ltu.edu, is a private university founded in 1932 that offers more than 100 programs through the doctoral level in its Colleges of Architecture and Design, Arts and Sciences, Engineering, and Management. PayScale lists Lawrence Tech among the nation’s top 100 universities for the salaries of its graduates, and highest in the Detroit metropolitan area. Lawrence Tech is also listed in the top tier of Midwestern universities by U.S. News and World Report and the Princeton Review. Students benefit from small class sizes and experienced faculty who provide a real-world, hands-on, “theory and practice” education with an emphasis on leadership. Activities on Lawrence Tech’s 102-acre campus include over 60 student clubs and organizations and a growing roster of NAIA varsity sports.